In the first half of 2015, Europe celebrates the 70th anniversary of the end of World War II. On an almost daily basis, you can follow the Allies’ progress across occupied Europe by following commemoration events – from the liberation of Auschwitz on 27 January to the Battle of Berlin from 20 April onwards, and the final surrender of the German High Command at Berlin-Karlshorst on 8 May. (Use Liberation Route Europe’s excellent app – LRE in your app store – for details on the route). Even with Germany over 50% occupied by Allied forces by February 1945, and no realistic hope of a military victory, Adolf Hitler and his staff showed no signs of surrender, instead preferring to fight to the bitter end – bringing country and population down with them (read Ian Kershaw’s excellent The End for an analysis of why they might have done that). To force a surrender, the Allies had to conquer Berlin. The job was left to the Soviet forces advancing from the East, and the first step was the Battle of Seelow Heights. I decided to go and see the battlefield. 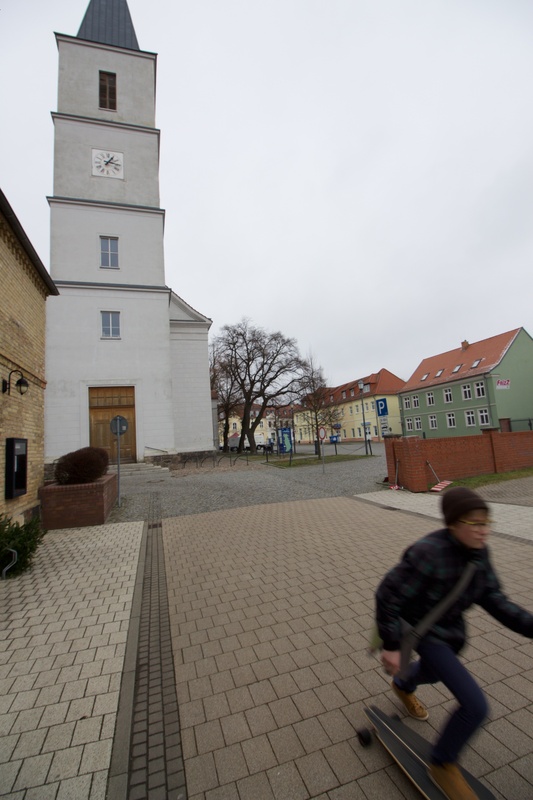 Seelow is a small market town on the B1 road, close to where it crosses the Oder River. The B1 used to be Reichsstrasse 1, which once ran all the way across Prussia, some 1300 km from the Dutch border at Aachen in the west to Königsberg (today’s Kaliningrad) in the east. (It actually shares its roots in middle Germany with the Westfalischer Hellweg, which dates back to Charlemagne. But that is another story). There’s trains to Seelow, but driving the road that the Red Army needed to secure for their final assault on Berlin does add to the experience. 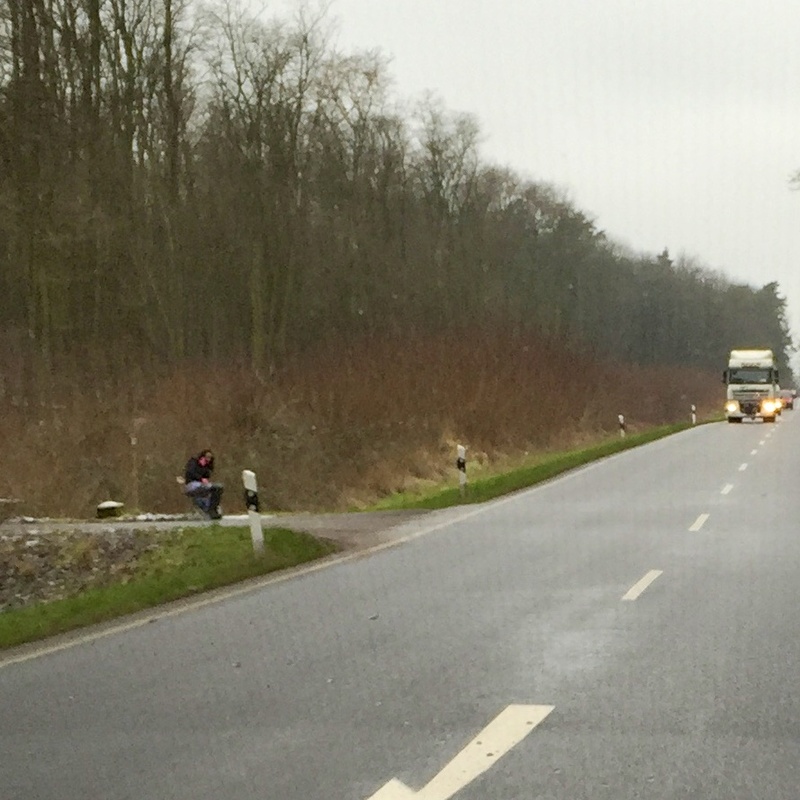 Berlin to Seelow is easy – just point east on Karl-Marx-Allee and keep going. It takes about 90 minutes and takes you across a varied landscape – after the GDR high rises of Marzahn, the road continues as a 4-lane highway up to Berlin’s outer ring road (A10) – but the cityscape quickly changes to typical one or two storey Brandenburg farm houses – interspersed with a variety of not too prosperous looking businesses. Once you’re across the A10, the road narrows to two lanes, and the country becomes slightly hillier, with the occasional S-bend in the road. It also passes the Nature Reserve of “Märkische Schweiz”, an example of the strange German custom of calling any area that is slightly hillier than the surrounding landscape “Switzerland”. As you approach Seelow, you can tell you’re getting close to the Polish border. In the last stand of woods before the town, even in mid-winter, there are girls sitting by the side of the road, waving at passing motorists, and chatting (to each other?) on their mobiles. Marshall Georgy Zhukov, the commander of the 1st Belorussian Front, had been pushing back Nazi forces through Ukraine and Poland since October 1943. In January 1945, he finally reached the Oder-Neisse line, at Kostrzyn, the point where Reichsstrasse 1 crossed the river. Here, his armies kept their position in the floodplain of the Oder river, only 70 km from Berlin’s Alexanderplatz, waiting for other Soviet army units to spread to the north and south, to allow for fully encircling Berlin. By 16 April, sufficient forces had finished their mopping-up operations further east for the final push to the German capital. General Theodor Busse’s 9th Army, consisting mainly of under-armed Hitler Jugend boys and little-trained Volksstorm fighters, had prepared its defences on a a north-south ridge in the landscape some 90 m high, flanking the Oder’s flood plain and centred on Seelow – where Reichsstrasse 1 scaled the Heights. 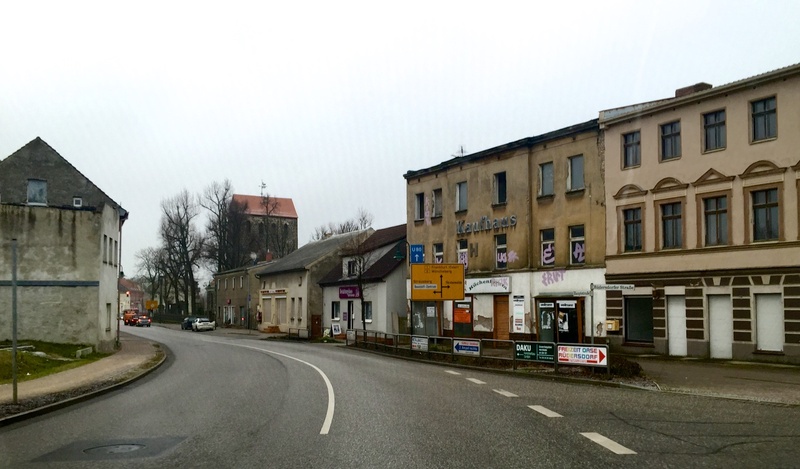 B1 (former Reichsstrasse 1), and the eastern approach to Seelow. The woods in the distance (approx. 1 km) are the Heights. The attack started before dawn. The Red Army used runway floodlights to light the battlefield and blind their opponents, but in the early morning mists, they only served to backlight the advancing infantry. Pushing across the muddy floodplain up onto the well-defended heights (which, from any distance, look deceptively flat) proved to be more difficult than expected, and the battle dragged on for days, causing heavy casualties on both sides. 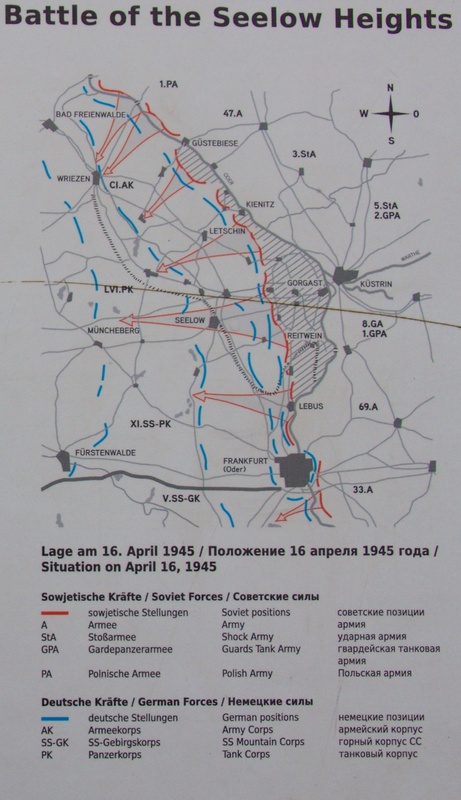 Only by the fourth day of fighting, the Soviet troops managed to break the German forces’ third line of defence at Seelow, and from then on, not much stood in their way until reaching Berlin’s city limits. The Battle of Seelow Heights turned out to be the last entrenched battle of the war between Nazi Germany and the Soviet Union, with tens of thousands of losses on both sides. After the Battle of Berlin, the Red Army wanted to honour its dead and mark its victory. Marshall Zhukov, who stayed on as military commander of Berlin and the Soviet occupation zone, commissioned three monuments immediately after hostilities ceased in May 1945: the famous Soviet War memorial on Strasse des 17. Juni in Berlin’s Tiergarten, the monument at Seelower Heights, and an obelisk at Kostrzyn, just up the road in Poland, which was removed in 2008. 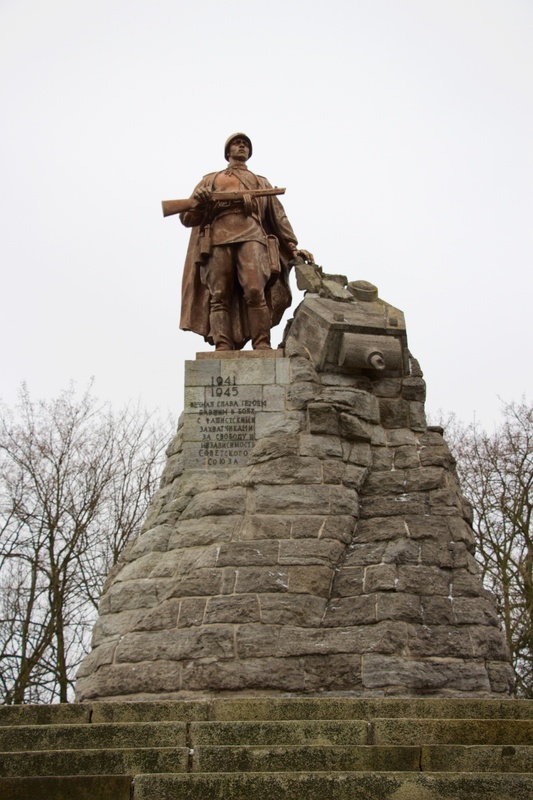 The monument at Seelow was created by Lev Kerbel, who also designed the Tiergarten memorial. The Red Army didn’t waste time: both monuments were inaugurated in November 1945. 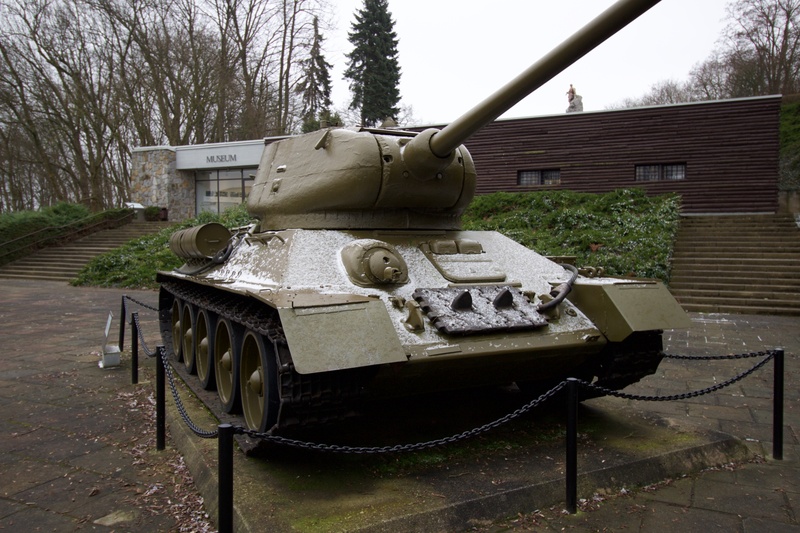 The Seelow statue shows a Red Army soldier with his hand on the turret of a defeated German tank. 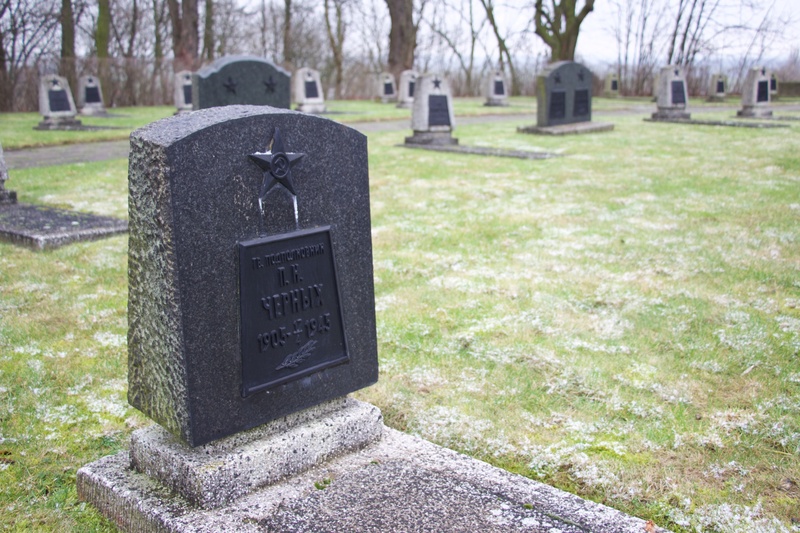 From the beginning, the memorial included war graves, but most Soviet and German casualties of the battle are buried elsewhere, at Lebus and Lietzen cemeteries respectively. The museum is worth a visit. It’s fully bilingual in German and English, and like so many monuments in the former GDR, it has an interesting history in its own right. 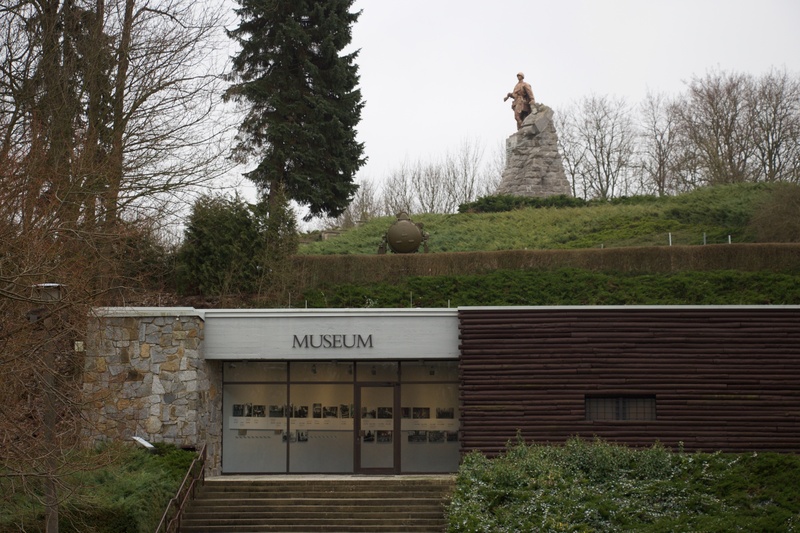 It was built in 1972 to complement the War Memorial on the hill, and has the shape of a typical Russian bunker. It was meant to pay tribute to the Red Army, and cement the everlasting friendship between the socialist peoples of the German Democratic Republic and the Soviet Union. 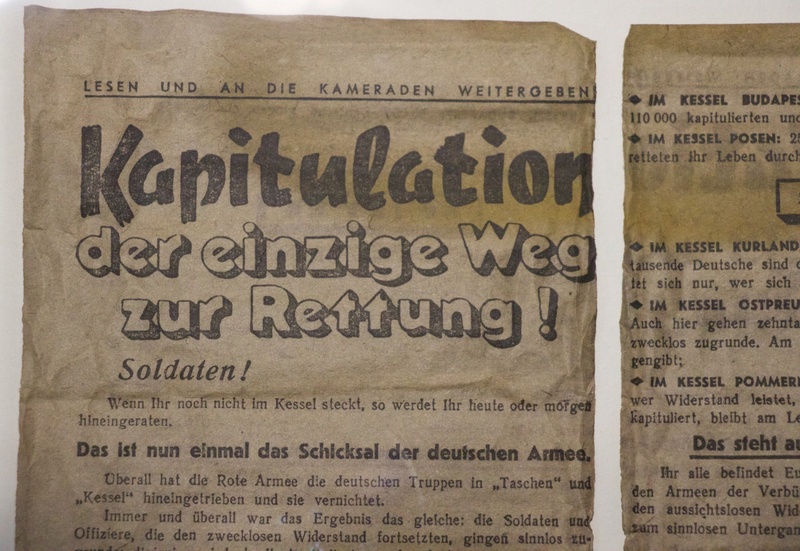 Although no one disputes the heroism of the Red Army soldiers giving their lives for the final push to rid Europe of the Nazi regime, after German reunification questions arose on the overtly political slant of the museum’s displays. 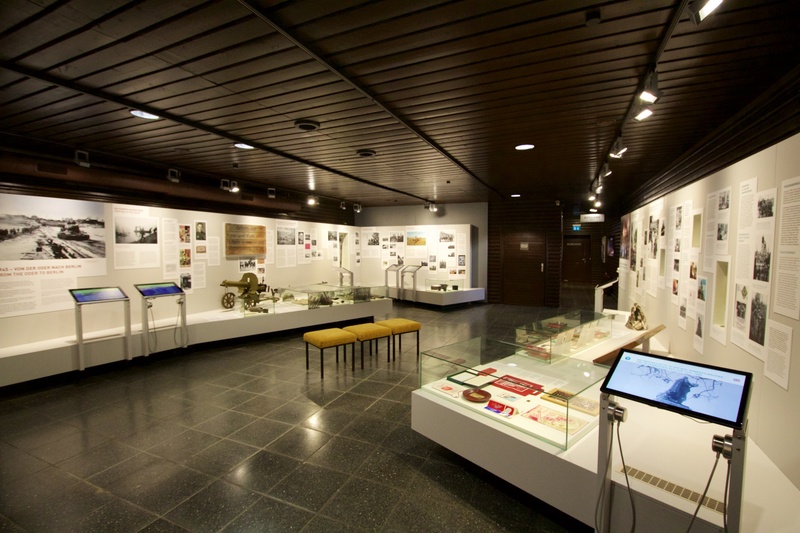 The exhibition texts were rewritten and by 1995 the current displays had been created. The museum now tries to do justice to victims on either side. 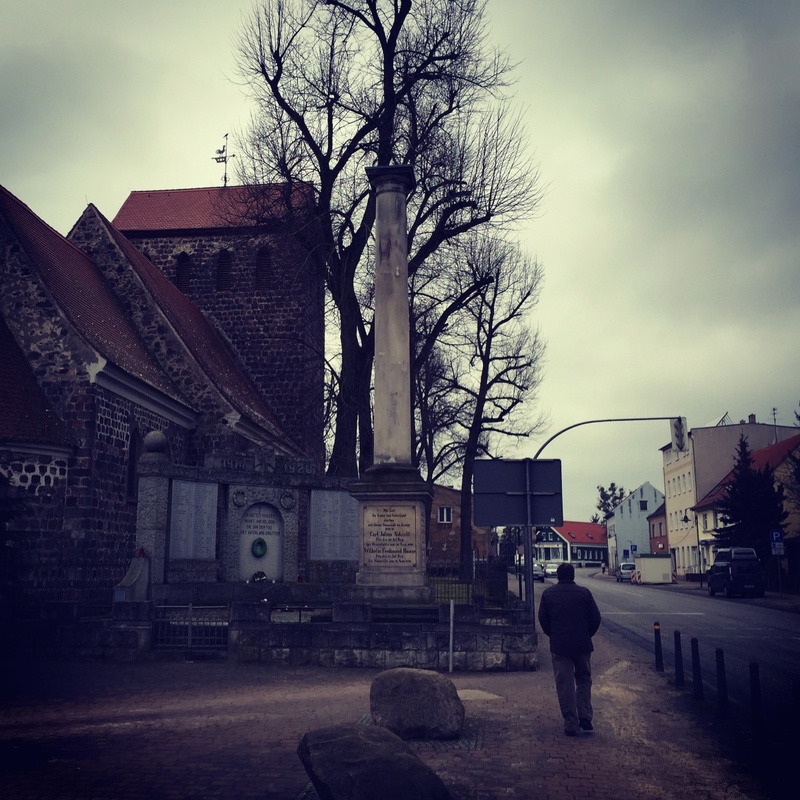 There’s no catering (or other facilities) at the museum, but Seelow has a nice town square, with some cafes and restaurants to make up for it. 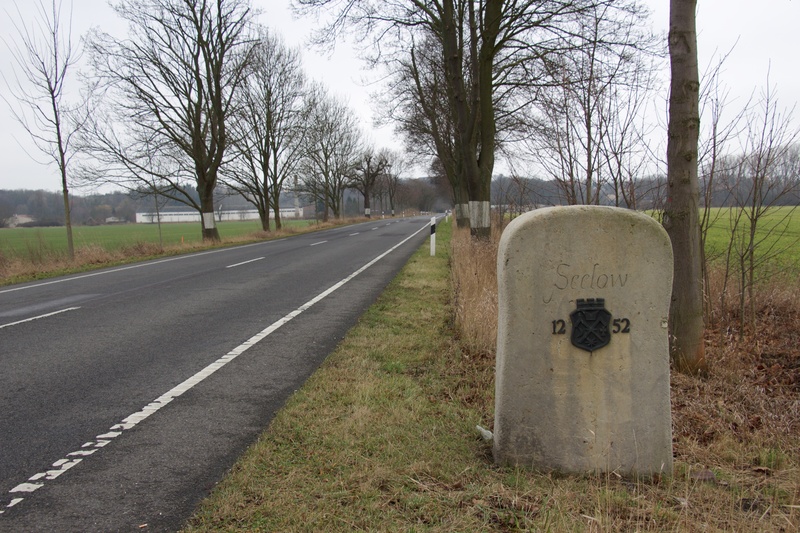 Unfortunately, the battlefield itself, in the floodplains below Seelow, is not signposted, and there aren’t any other monuments beside the main one, so after finishing your Kaffee und Kuchen, you’re probably best off following the Red Army’s tracks back up the B1 to Berlin. How Bavarian motor bikes came to Berlin. Info display at BMW’s Spandau factory. Today, there is not a lot of heavy industry left in Berlin. The city that once was the home of huge factories like Siemens, Borsig, and AEG never recovered from World War II. What wasn’t bombed by the R.A.F. and the US Air Force was dismantled and carried off by the Soviet, French, and British occupying forces, what wasn’t dismantled was either nationalised (in East-Berlin), or was left to die a slow death in the isolation of post-war West-Berlin. 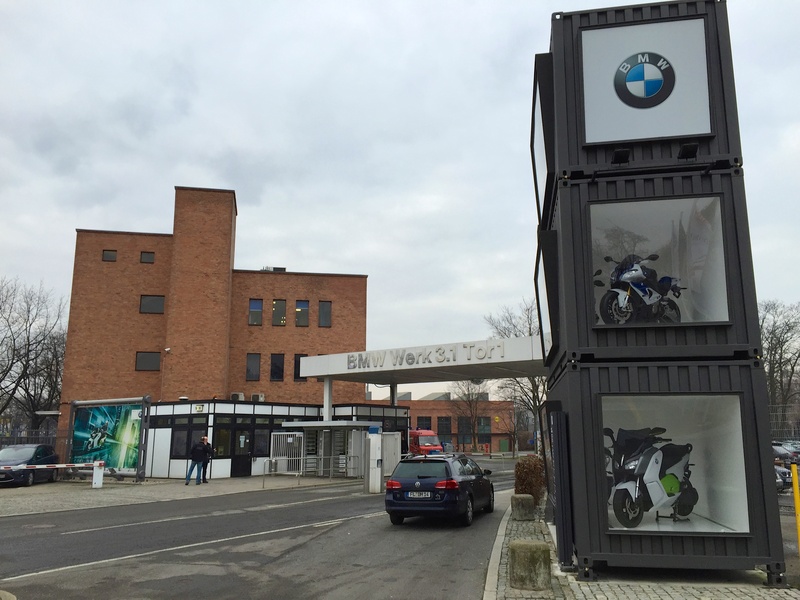 But there’s an exception: BMW’s motorcycle factory in Spandau. Since 1969, BMW has built all its motorbikes at this site (with the exception of the original F-series 1-cylinder bike in the 1990s). Today, some 110.000 bikes leave the factory each year for shipment over the world. That may sound like a lot, but Honda, its largest Japanese competitor, builds five times as many – and that’s down from a peak of 3 million in 1982. BMW relocated its bike production to Berlin as it was running out of space in its factories in Bavaria. But it had a long history at the site. Originally built as an airplane engine plant by Siemens in 1928 (the factory is adjacent to an area called Siemensstadt, a complex of factories and modernist flats for workers, now a Unesco World Heritage site), it was spun off as ‘Brandenburgische Motoren Werke’ or Bramo in 1936 – after all, the BMW acronym was already being spoken for. The plant built radial engines for planes such as the Junckers Ju52/3m – known throughout Germany as the Tante Ju (Auntie Ju), the German equivalent to the reliable and multipurpose DC3 ‘Dakota’. 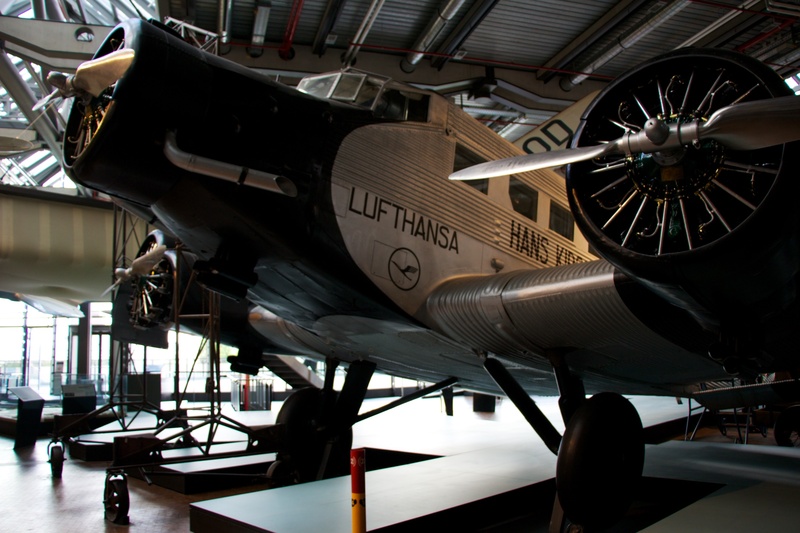 Junckers Ju52 at Berlin’s Technikmuseum, with three 9-cylinder BMW radial engines. By 1939, BMW, by then a motorcycle, aeroplane engine and motor car producer, acquired Bramo and continued building aircraft engines at the site. After World War II, the plant’s equipment was dismantled by the Allies. Low scale production of useful stuff like sickles and scythes continued at the factory, but it returned to full operations in 1949, constructing motor cycle parts for BMWs assembled in Bavaria. Gate 1 of BMW’s Spandau motorcycle factory. No photography beyond this point – except for the visitor centre! 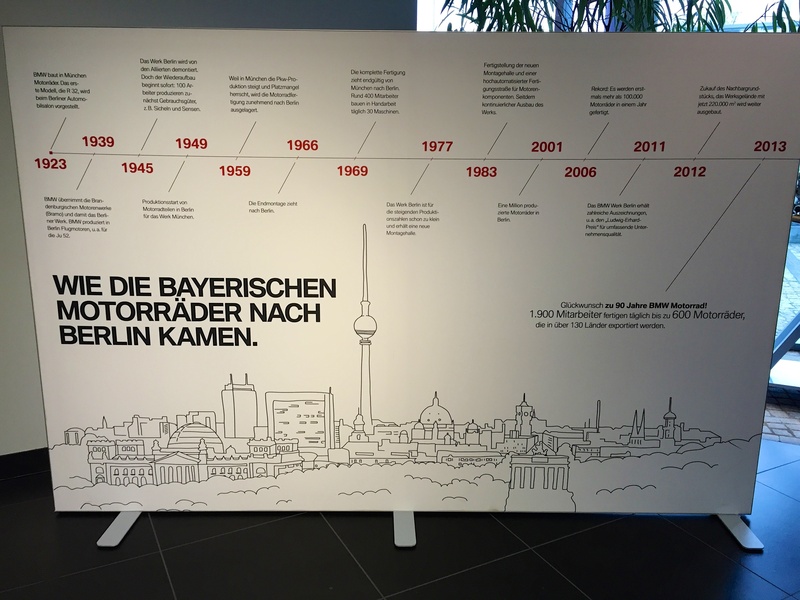 What certainly influenced BMW to bring all motorcycle production to Spandau were the lavish subsidies the Senate granted to anyone wishing to invest in West-Berlin – a sum of 200 million Marks (in 1969 money!) was granted just to redevelop the site. But whatever the original motive – the company has stayed the course, and is even expanding. It’s bought a plot of land adjacent to the factory to build a new assembly hall. 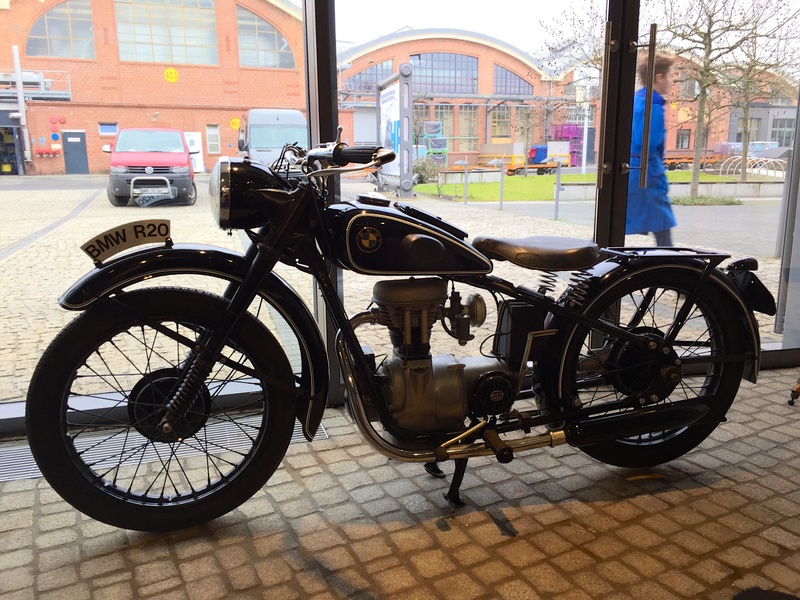 BMW’s first motorcycle, the R21 from 1923, in the visitor centre at the Spandau plant. In the background: part of the almost 100 years old machining hall, where engine parts are made. When you take a tour of the factory (6 euros, book through the bmw.de website), you see why they need the extra space: while quaint, the long history of the factory means that it consists of a large number of smallish buildings, some from the early 20th century, and the logistics of keeping everything organised must be a nightmare. As mentioned, the production numbers at BMW Motorrad (the subbrand’s official name) are not spectacular as far as global bike factories go – but then, as BMW likes to point out, they are a high end brand, and there’s a lot of manual labour in constructing each bike. One of the interesting things you see on the tour is how much of the work is done by hand. There’s robots for the heavy and dangerous stuff, but a lot of the assembly work is done by people who have usually entered the factory as trainees straight out of school, and are quite happy to spend their whole careers there. In Berlin terms, they are good jobs to have.